Slugs are legless, boneless creatures. They are similar to snails, but have a raised mantle on the back instead of a shell. 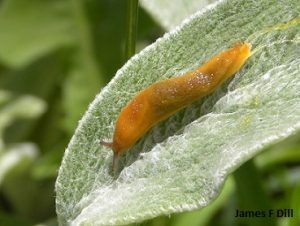 Slugs overwinter mostly as eggs, but adult slugs can survive Maine winters, if they hide in areas protected from freezing. The gray garden slug is the most common and most destructive. This 3/4 inch pest varies in color from whitish yellow to nearly black, with brown specks and mottling. The spotted garden or giant slug can range from 3 to 7 inches long. These slugs become lighter in color as they age. The yellowish mantle usually has three rows of black spots that continue to the end of the body. The species is found primarily on islands and along the coast, but it is becoming more common inland. The tawny garden slug length extends to about 3-4 inches. It is usually recognized by its yellow mantle, and lighter spots on a yellow body. This type is less common than the gray garden or spotted garden slugs. The approximately 100 eggs laid by male or female (slugs are hermaphroditic) gray garden slugs are about 1/8 inch in diameter. A 4 inch slug may produce eggs up to a 1/4 inch in diameter. It takes about 100 days for slug eggs to hatch at 32° to 40° F, but only 10 days in warmer weather, as in late May. Under ideal conditions with damp, warm weather, the life cycle of a slug can be about three months. Young slugs damage plants by rasping away the surface of plant leaves. Adults also chew holes in leaves and leave slime trails on commercial plants, thus reducing salability. 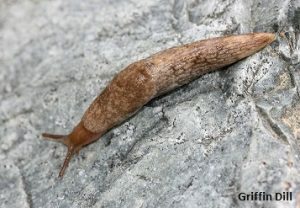 Slugs need moist areas, protection from sun and wind, and nourishment to speed their growth and increase populations. Good sanitation can deprive them of most of these needs. Removing boards, rocks, logs, leaves and dense growth helps. It is also wise to minimize shaded areas, rock walls, rock gardens, or forested borders and leave bare ground or close-cropped grass next to vegetable or flower beds. Slugs avoid crawling over anything dry, dusty or scratchy, such as lime, road dust, diatomaceous earth, cinders, coarse sawdust, gravel or sand. Secretion of enough mucus to free themselves from these materials soon exhausts them and they die. A border of any of these inert materials, therefore, helps control slugs. It is also reported that hydrated lime, Bordeaux mixture or urea repels slugs. Remember, however, lime effects the pH of soil. Never use salt as it ruins soil for most plant growth. A fly screen, 4 inches wide, placed on edge and partly embedded in soil for support, keeps slugs out of an area. Boards, bark, or other materials not less than six inches square make effective traps when placed in gardens. Each morning you can gather the slugs from under the traps and destroy them. 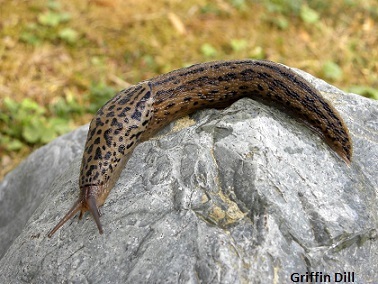 An hour spent hand-picking and destroying slugs can noticeably reduce the population. Slugs can be kept from potted plants by placing the pots on boards or other supports over water in a pan. Alternatively, wrapping stems with cotton batting may keep slugs off plants. Copper tape is commercially available as a slug barrier and is especially effective in raised bed plantings. Toads are slugs’ most important natural enemy. Many people claim that several ducks keeps a garden slug free. Slugs are attracted to and drown in a shallow dishes or aluminum pie plates containing beer or baker’s yeast dissolved in water. Set the top edges of the dish at ground level and cover loosely with a board so slugs can easily get into the mixture. Iron phosphate and metaldehyde baits are effective in controlling slugs. Be sure to read the pesticide label carefully for information on bait placement and permissible crops. It is best to read the label before you purchase the material.